Mardi Himal to Annapurna Base Camp trek is a relatively new and hence, a less explored trekking route in Nepal. The trail lies on the east of the other more popular trekking routes in the Annapurna region. Away from the busier and more crowded trekking routes, the trek is an ideal get away for those interested in trekking and also as well for the beginners as prior experience isn’t needed. The trail is small and winding, passing through villages, beautiful and dense rhododendron forests, narrow valleys up to High Mountain landscapes with homestays and tea houses along the entire route. The trek offers visitors a chance to experience the culture and traditions of the local communities, to feast their eyes upon the incredible sceneries, endless diversity of flora and fauna of the region, and views of mountains such as Mardi Himal, Machhapuchhre (Fishtail), Annapurna south and Hiuchuli. All these elements make this one an ideal trekking experience in Nepal. Mardi Himal to Annapurna Base Camp Trek begins after an hour’s drive from Pokhara to Kande. Trekkers shall make their way up towards Australian camp and then down to Pothana 1890m and again up to Deurali 2100m. The trail then passes through dense rhododendron forests into Forest Camp 2600m. From then it’s a steep climb passing through more forests with occasional glimpses of Annapurna South before getting into Low Camp (2970m). The trail then leads into High Camp 3550m (mistakenly shown at 3900m in trekking maps). As you trek towards High Camp you’ll notice how the landscape drastically changes into a rugged high mountain landscape, with amazing views of Mardi Himal, Machapuchre, Annapurna South and Hiunchuli. 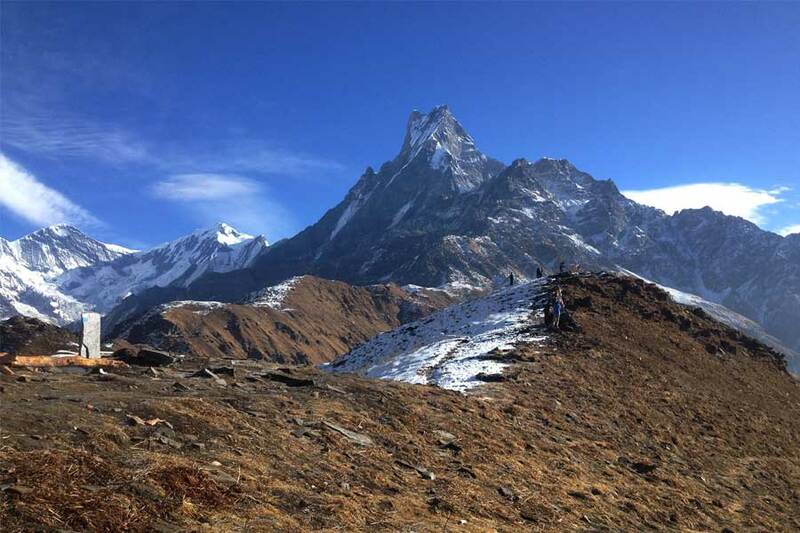 Trekkers can then head further towards the Mardi Himal base camp at 4500 which is about 4 hours from High camp and again make their way back towards High Camp in the same day. After the Mardi Himal, The you will trek to Annapurna Base Camp Trek via Landruk. This is new trekking route in Annapurna Region. Welcome to the city of temples and the country of Himalayas. We will happily welcome you at the only international airport of Nepal;Tribhuvan International Airport. Our airport representative will be waiting for your arrival with a placard written yoru name outside the airport terminal then transfer to hotel. DAY 2 – Drive to Pokhara (850 m) / 6 – 7 hours. The drive is pleasuring through beautiful countryside of this country. The road mostly takes on nearby the thundering rivers that might give us some views of rafters enjoying another part of Nepal. We will be driving via several green hills with views of houses and villages in the cliffs. Snowy peaks from the distance in some paces will also welcome us. It’s beautiful drive though the road condition is not good everywhere. We will basically have two stops for snacks and lunch along the way. Finally, after reaching Pokhara bus station we will take a taxi to drive to your hotel. If time permits then we can walk around local markets and lakeside in the evening. DAY 3 – Drive to Kande Trek to Forest Camp (2,540 m) / 8 – 9 hours. Kande is on the top of a hill near Pokhara offers some views of Himalayas. From here we will start our trek approaching Pothana first. The trail is enjoyable throughout the villages. We will have some views of villages in the horizon. Continuing further will take us to PitamDeurali, our lunch stop. We will taste the first mountain meal in Deurai and continue further to Forest camp. The trail is mostly inside the green forests of oak, maple, hemlock and rhododendron. The section includes some ups and downs and takes about 3-4 hours to reach Forest Camp, a small village with few guesthouses. Forest camp is known as Kokar among local people. It is a difficult walk from PitamDeurali to Forest camp. We will have to walk inside the forest for another day but as we reach higher the vegetation changes with more rhododendron trees. This is another pleasant day for us letting us walk in the peaceful route. The trail is steep at the beginning however changes to gradual climbing after awhile. We will have some random views of snowy Himalayan peaks. The view of Machhapuchhre peak is superb from Low Camp. 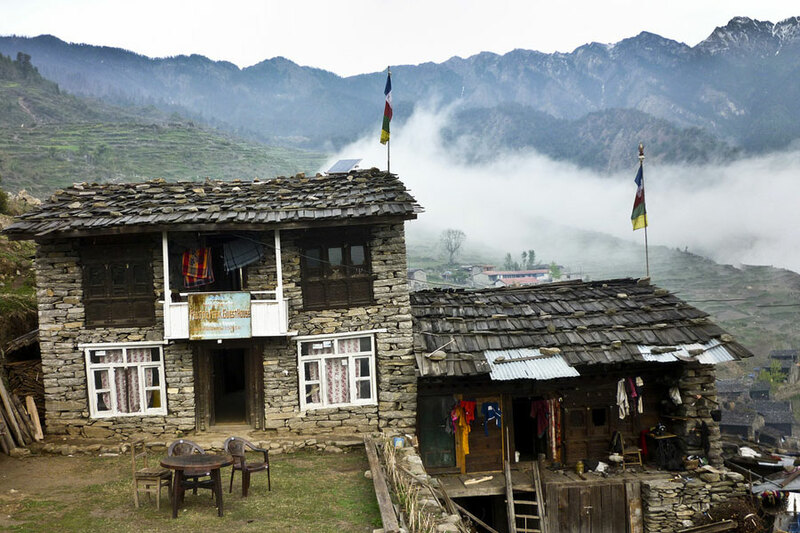 This is very small place with only couple of lodges opened for providing basic meals and accommodation to trekkers. We have another pleasant walking here with stunning views of close Himalayas in front of us. As we climb higher the route also becomes open and spacious, as there is no forest anymore. The trail continues through grasslands of high region with occasional rhododendron trees. Spotting the beautiful bird called Himalayan Monal; also known as the impeyanmonal, impeyan pheasant and danphe in Nepali is easy around here. This is a colourful Himalayan bird represented as the national bird of Nepal. Finally, we will arrive to High Camp to spend a night here. We will wake up early in the morning before the sun rises. The plan is to watch sunrise over the Himalayas. We will then return back to lodge where we will be served with our breakfast. We have time to rest before we start hiking up to the upper view point for magnificent views of close Himalayan peaks. The trail heading to Upper View Point is well marked through the grassland involves few steep sections. In overall this is moderate walk, not too easy and not too challenging as well. In summer season this area is full of yaks and sheep along with several yak herder’s huts. There are some narrow and steep trails that extensive care is required. We take a separate route to Landruk village. This is huge village that is on the way to Annapurna Base Camp. We will come to a junction that separates us between the trail heading to Low Camp on the left and Landruk on the right so we take the right one. Descending further will again bring us back inside the forest where the trail is so peaceful and quiet. Turning one and another circles we will then reach Landruk village for overnight stay. The trek from Landrung leads to the last teahouse just by the path towards another Phedi of Landrung and Ghandrung, our route diverts away from this path following the back of the teahouse and on the farm terraces and finally reaching by the bank of ModiKhola, the route follows the ModiKhola up streams and reaching to Nayapul (New Bridge) a small settlement with a good bridge over the raging Modi River. From here it is more uphill climb all the way Jinwa village, from Jinwa another 1-2 hrs walk leads to a steep uphill till the path joins coming from KimcheKhola. ?On reaching the good wide stone paved path, the walk from here is fairly gradual with downhill till Chomrong village is reached for the overnight stop. Chomrong village situated in the small valley just near beneath the peaks of Annapurna south. This is the last permanent village. From Chomrong the trail leads to the terraced farm fields as you descent to the river, after the bridge it’s uphill most of the way for 2-3 hours till a small place of Khuldi-ghar is reached here your Trekking permit and conservation ticket is checked and registered, after Khuldi the trail leads down hill for 1-2 hour through the bamboo bushes till you reach Bamboo, a place in the mid of the bamboo rhododendron and oaks forest with couple of teahouses. After a brief stop here an hour walk on the gradual uphill path brings you to our overnight halt at Dovan, an isolated spot with 2-3 teahouses, midst the forest near raging Modi River. After Dovan, in the cool shade of the forest the walk is gradual up most of the way following the river Modi upstream, the trail continues with few ups and down as you reach Himalaya Hotel near Hinko cave, which lies straight at the bottom of Hiunchuli peak. Himalaya Hotel is a small place with 2-3 lodges just to cater the need of the trekkers. The trail from here is gradual up for another 1-2 hours to Deurali the last place with tea-house-lodge on route to Maccahapuchare Base Camp. As you reach Deurali the lush vegetation disappears leaving for high alpine flora and shrubs. Deurali has about 2-3 teahouses, rest of the afternoon free at leisure. From Deurali, the trail leads up to follow the raging Modi River upstream, the track is quite pleasant in some places with few strenuous climb for an hour in between and at the end as you reach the Maccahapuchare Base Camp. Maccahapuchare base camp has about 4-5 Lodges located on the even ground beneath the mighty north face of Maccahapuchare peak. Today’s walk leads you in the heart of the Sanctuary at the Annapurna Base Camp, the trail follows uphill for few hours, on the snowy grassy path, depending upon the season, the trek is very pleasant as you reach the higher ground with magnificent view of an array of snow peaks all around you with Annapurna I, a great wall of a mountain from this north west face. Annapurna Base Camp has the superb panorama. After a great time here retrace the journey back to Himalaya Hotel near Hinko Cave via Maccahapuchare Base Camp for the overnight. A lovely day walk in the tranquillity of the mountains and in its serene wilderness trek back to the lush green vegetation, the walk is more or less downhill with few ups to Himalaya Hotel. From Himalaya Hotel retrace the journey back to Chomrong by the same path, the morning walk leads to a short climb to Khuldi where you check out in the register, The trail descends all the way to the bridge, from the bridge uphill will to Chomrong. After Chomrong the walk leads to a short uphill, descend towards KimcheKhola valley the road splits here where the trail from Landrung and Kimche Valley joins (if you go straight down it leads you to the same path that you entered from Landrung) today’s route leads to Kimrongkhola valley, stick with your Sherpa Guide, the new trail branches off from last Tea-house of upper Chomrong, the trail is pleasant on the wide track till downhill path for an hour follows till you reach the Kimche valley and it’s village after three hours of good walk. From Kimche Valley a short gradual path leads to the bottom of the Kimrongdanda ridge, the climb takes for an hour towards the Kimrongdanda where there are few teahouses / lodges where you can refresh with soft drinks and teas. ?From here a gentle downhill walk reaches you at Ghandrung village for the overnight stop. 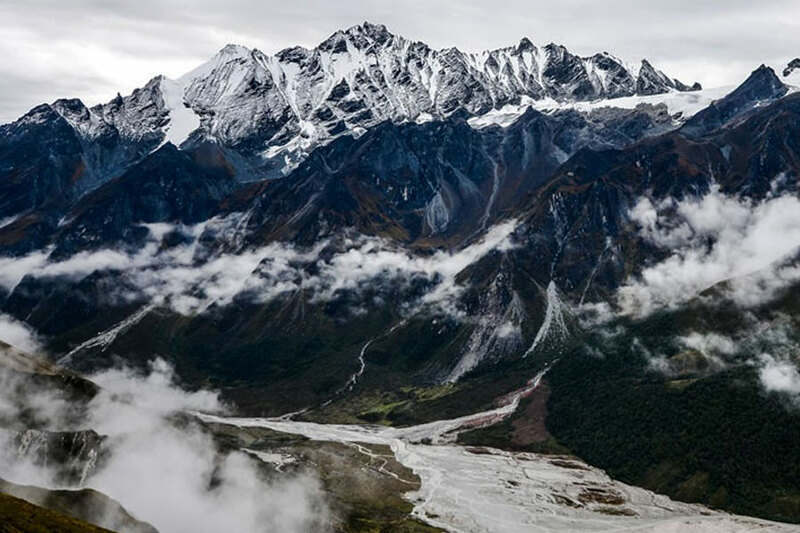 From Ghandrung the walk descends on the wide stone paved path passing through farm villages of Kimche till Syali Bazaar is reached, from here the walk leads on the gentle winding trail following the River Modi all the way to Nayapul. The walk from Syali Bazaar / Bhatti the good walk leads to Bhirethati after an hour walk, Bhirethati one of the charming village on this route. From here cross the bridge over ModiKhola and follow the ModiKhola till Nayapul is reached. On reaching Nayapul board on the Bus for an hour and half drive to Pokhara for the overnight after a wonderful time in the tranquillity and wilderness up in the mountains. Morning transfer to Tourist bus park and take a bus to Kathmandu. 2 nights accommodation in Kathmandu at 3-4 star Nepalese standard hotel. 2 nights accommodation in Pokhara at 3-4 star Nepalese standard hotel. Full board meal (veg. / non veg.) prepared by our expert cook.